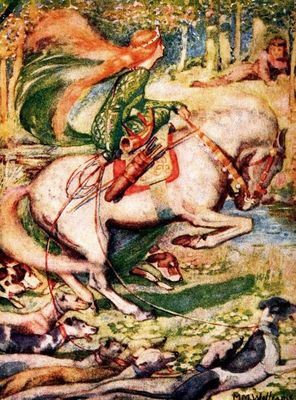 “Thomas the Rhymer and the Fairy Queen.” Illustration by Meredith Morris Williams. Published in The Scottish Fairy Book by Elizabeth Grierson (1910), Frederick A. Stokes Company. Read Scottish fairy tales from the Highlands and the Lowlands of Scotland collected by Charles Tibbits, Andrew Lang, and more. Browse full list of Scottish fairy tales. About: If tales of giants and fairies intrigue and excite you, the Highlands of Scotland offer some of the most vivid and captivating fairy tales ever recorded, but it is from the Shetland Islands you will find the chilling and riveting tales of trolls. Scottish folk tales take different form and function depending on the part of the country they hail from, but all share an affinity for fantastic and mythical creatures. You can read about brownies, bogles, mermen and kelpies in an imaginative world so closely connected to the natural world that it’s difficult to tell where one begins and the other ends, or even, if they do at all. Scotland’s Celtic history spans over 2,000 years. With druids and witches and deeply rooted superstitions, the folkloric pot of Scotland bubbles over with stories for children, fairy tales, and legends of lore. The hill shepherds were known for being dreamers and poets, and the Lowlands produced many a fine Rhymer. The belief in fairies was so strong, that even in the face of Calvinism, fairies continued to flourish and clergymen would assist people whose women had been spirited away, and whose babies were turned into changelings. Imagine the revered storyteller, the musicians and entertainers, the bards, all of them wandering paupers, but hailed as Kings when lodged in someone’s home for an evening. People from all over the town would gather to hear the fairy stories brought to them from other regions, and pack out the house while they listened to the storyteller weave his wondrous tale. Scottish folk tales circulated through the mouths of peasants, but were welcomed by all. The folklore of Scotland is a tapestry of culture and history, but more importantly, a portal for the imagination. Charles Tibbits, an editor at W.W. Gibbings, helped compile a collection of 33 tales from Scotland into Folk-Lore and Legends: Scotland.